In building the school box, I wanted to stick close enough to the plans to learn the lessons therein, but also not constrain myself too closely to the particulars. I think this is fitting to the spirit of the thing. As Thomas builds, he builds by eye and to taste, and as long as the lesson is something already within my grasp I’m comfortable varying from the original to suit my own tastes. It’s all about looks anyway. 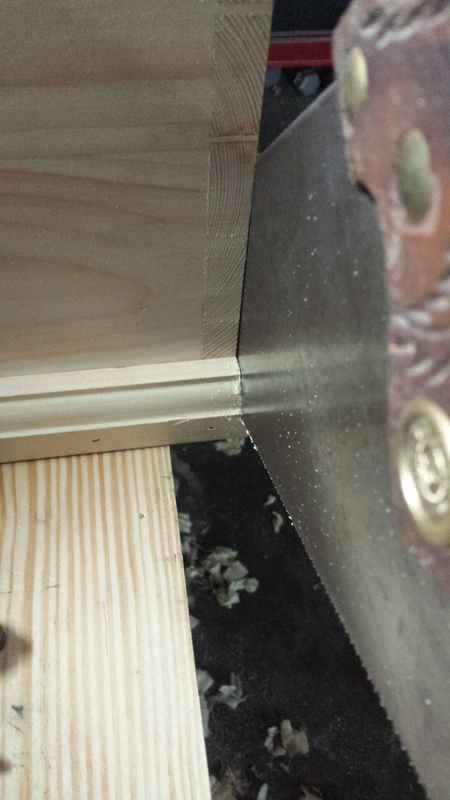 I did decide to stick with the mitre joint instead of dovetailing the parts. I’ve dovetailed chest skirts in the past, but honestly I don’t often use mitres, so I thought it would be a good opportunity to learn. After sticking the moulding I sawed the strip down to 1 1/2″ and cleaned up the saw marks with my no.7 which was an experience in itself. I planed the full 5′ strip at once. 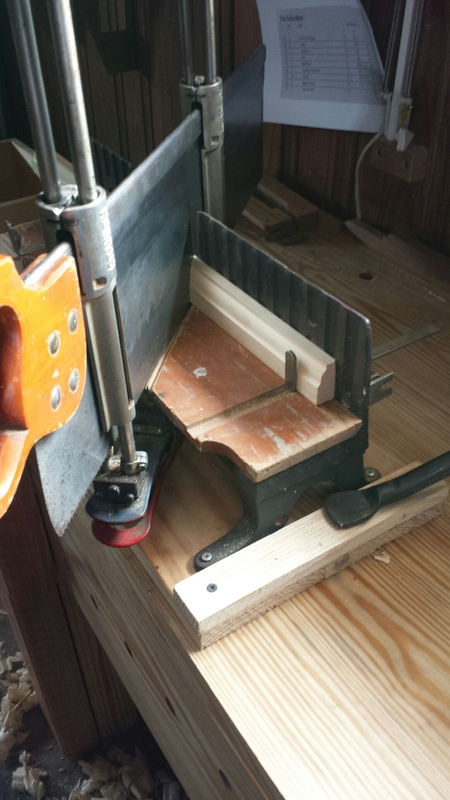 The leg vise and aprons on my bench came in very handy for securing the moulding the length of the bench. 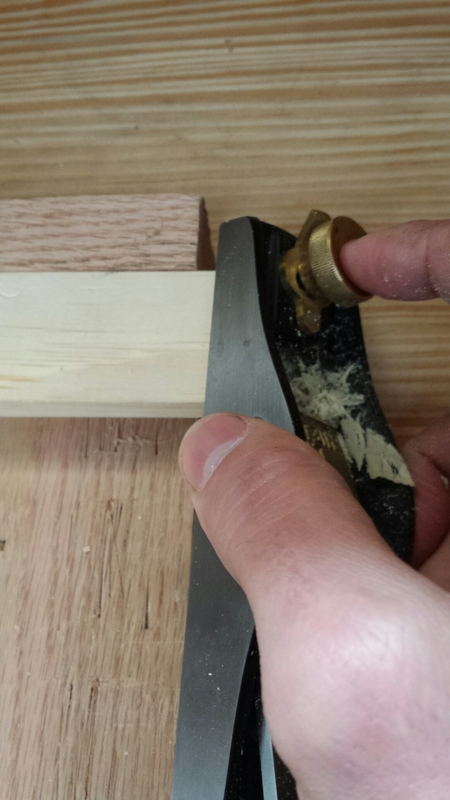 Once the strip was uniform I cut the strip to lengths with my mitre box. Beginning with the front strip I cut the mitres and then planed them free-hand with my low-angle block plane. With a sharp iron this was no problem at all. From that point I fit the sides and left them overlong as Thomas does. 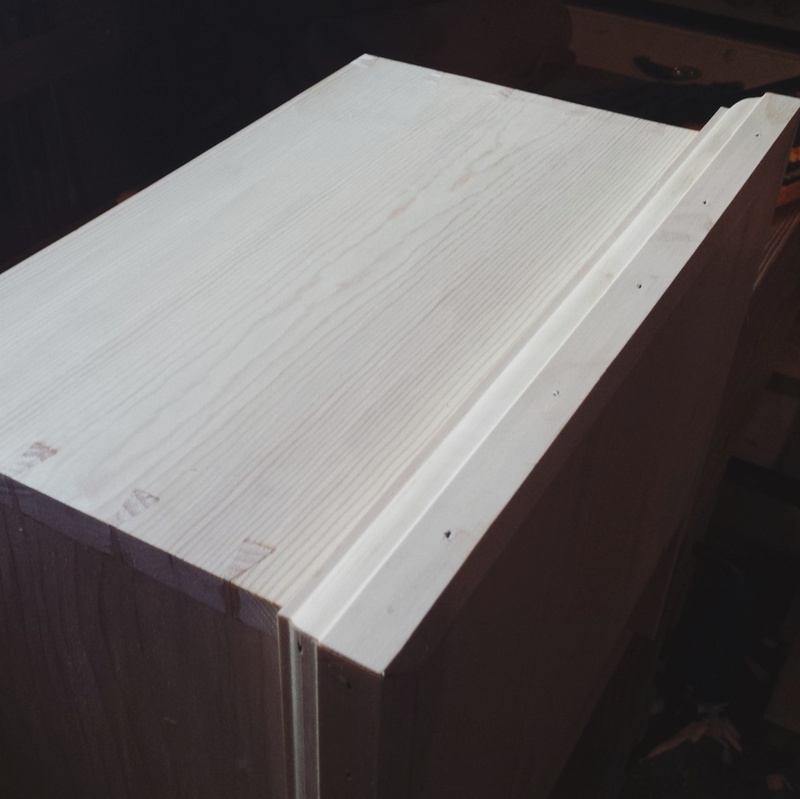 I did leave the stock 3/4″ thick instead of the 1/2″ that Thomas used, but that was really just so that the profile of the moulding came out right. It meant I needed slightly longer nails than recommended, but that was no problem. I drilled my pilot holes and then lightly tapped 4d cut brads into each hole until they were just poking out of the back. Gluing and nailing the moulding went easily but it did require a little fussing just to make everything tight. 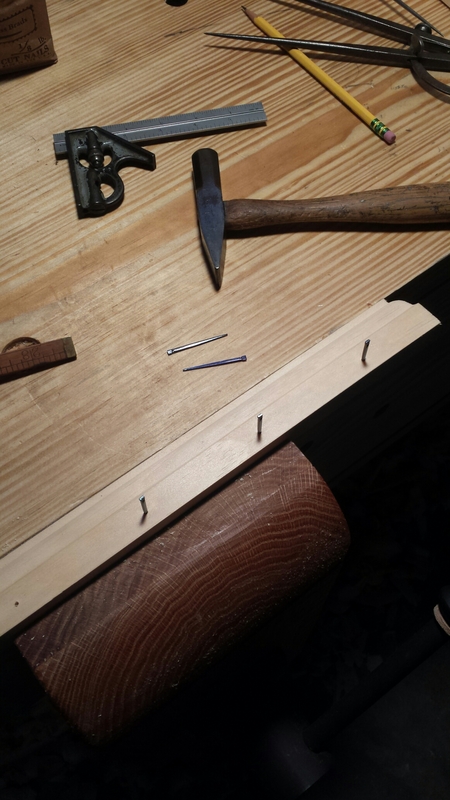 I used clamps to hold things in place while nailing, but I didn’t need them when the nails went in. After I let the glue set a little I went back in and trimmed the back of each side with a hand saw and cleaned up the saw marks with the low-angle block plane. I feel good about where this project is so far and now I need to make some decisions about the inside. Master John wanted a little box to hold his marbles, apples and nuts, but I’m not convinced I need the same thing. More on that to come.